Recently it struck me that I have been using ellipses (. . .) quite a bit in my informal writing. Like most people I compose at least a few emails each day and while, by most standards I am an infrequent texter, I do send out a modest amount. In both of these formats I’ve been dot, dot, dotting left and right. And after sharing this observation with a few people and following up with a quick search on Goolge it became clear that I wasn’t alone. The ellipsis is the darling of new media. So this led me to wonder if there was some significance in this grammatical development, or if it was just some combination of convenience and coincidence. An intuition of sorts formed in my gut telling me there was something deeper going on. So why is it this particular mark of punctuation has suddenly become so prominent? Within the world of emails, texts, and chat rooms a certain grammar has evolved. It’s not the King’s English, but it isn’t quite anarchy either. Rules and established usages have emerged, and within this emerging grammar the ellipsis functions in certain defined ways. For example, it can signal that the sender is still awaiting a reply after an unusually long break in a text exchange, as if to say “Still waiting . . .” Or, it can signal that another text will follow to complete the present thought, “Hold on, more to come . . .” And in some other cases still it may be used to express awkward silence . . .
As I kept thinking about my own use of the ellipse I realized I was also using the dots in some more subtle ways. For example, Seinfeld came to mind. This isn’t all that unusual, after all the show about nothing sometimes appeared to be about everything. So it struck me that the dots sometimes functions in much the same way as the phrase “yada, yada, yada” made famous on the sitcom, as a way of saying “etc. etc.” with a certain bored indifference. At still other times I was using the ellipsis as a stream of consciousness device, stringing together thoughts that may not be formally or self-evidently related, but that nevertheless flow one from another in some weird associative way . . . in my mind. And as that last line suggests, sometimes one may use the ellipsis, as my wife noted, as a way of getting the reader to read in a dramatic pause, often for comedic effect. All of these ways of using the ellipsis, however, were not getting at my gut instinct. These were all still fairly utilitarian uses of the mark, but I sensed that something more was going on. I suspected the dots somehow signaled some shift in our way of thinking and expressing ourselves, that perhaps it was a symptom of our cultural condition surfacing through our writing. Then it dawned on me. I realized that at times I used the ellipsis to communicate a certain vagueness and ambiguity in what I was saying. I used the dots to convey hesitancy and indeterminacy. It was the mark of a thought that refused to assert itself. The ellipsis gives expression to a habit of ironic detachment and preemptive indifference. And here is where I found the point of contact with larger cultural trends. The mood of ironic detachment that has settled over so many of us was manifesting itself in three simple dots. With those dots we were evading conviction, giving off an apathetic vibe, and guarding ourselves from seeming unfashionably earnest. WOW…I will take up this challenge. I love my …’s. I feel as though I often have a thought that needs to take a pause and I’d like to continue the thought after these brief messages…or ellipsi as it were. “A thought that needs to take a pause.” I like that. Well, I use ellipses a lot. They are all over my blog. I use them more in the ways you discuss in the beginning of the blog. I don’t think I’m whimpering all over the place. But maybe you can analyze it for me (www.crystalspins.com). I am also an em dash junkie. I love them so much more than commas for setting aside independent clauses. You think that’s a cultural issue as well? Either way, Love your post! Dashes are extremely useful as well! Good point. The key is to speak with respectfully and with conviction. Guilty of the ellipse addiction. I use it as a glimpse into my rattled mind and it’s endless inane thoughts. Helps spice the blog up a bit. Plus, it’s so like… y’know…hard to express yourself using only text…like, there’s no voice inflections, body language… or stuff like that to rely on…Dot dot dot helps to convery just how unsure or indifferent you are, which is true most of the time, kwim? Anyone here use this. To. Get. A Point. Across. I used to like it. But. Now. I. don’t. You’re right, it does help to convey certain moods and tones. Am I having deja vu or have I read this same post on Freshly Pressed a couple of months ago? Great post nonetheless. And, yes… I also use the dot, dot, dot a lot. Not quite, I did post a previous version of some of these thoughts, but it was never Freshly Pressed. You must have just stumbled upon it then. Glad you enjoyed either way! I can’t comment on what you’ve written, except to add that most of the people I know (educated, otherwise sentient people) now seem to believe that ellipses are “an arbitrary number of dots, signifying absolutely anything.” In fact, some believe the more dots, the more emphasis on what they are saying. This exhausts and frustrates me to no end………………………………..
I’ve been out of control with my … usage lately too. Glad to hear that I’m not the only one! Thanks. I’ll be dropping in on your blog as well. The relationship between digital media and print is also an interest of mine. Thanks. My blog is in its early infancy, but I ‘ve been writing and editing for a few years. I’ve got a piece on the future of the monograph and the university press coming out in the Journal of Scholarly Publishing (not sure when, could be this October) which might interest you. I imagine … is a pet peeve of someone out there, but I love it…no I love it! Before reading this I had not even paid attention to how much I do use… and Mali is absolutely brilliant! I love listening to him!! Interesting; never thought about this. I confess to a fondness for the use of ellipses myself. Maybe it’s because they’re the equivalent of open-ended books/movies and challenge the readers to do some thinking on their own. Maybe it’s because I’m just plain lazy and let the reader do what I should’ve done myself but couldn’t be bothered with. And I absolutely love Taylor Mali, especially this one! Wow! This is a great read. I’m an avid user of the ellipses and also text it frequently to my friends. I hardly use it in my blogs, though, but occasionally it pops in. I would have never thought so much about the meaning of the ellipses and I think what you assert is heavy stuff to think about. The dot, dot, dot does reflect our hesitancy to act, to be assertive, to be sure of something. And while I like to use it for comedic pauses and awkward silence, I have often used it because I wasn’t sure about something. Great read and congrats on making Freshly Pressed! Self-confessed dot-dot-dot user right here. Who knows if I use them correctly but I dig them. It’s my pause… for emphasis. I have to admit, they are versatile. Great post and awesome vid to match your thoughts! And I say that WITH CONVICTION, ha!ha! Thanks, I thought it was a nice fit. Oh, I totally love the ellipses too. It’s difficult to get rid of them because I use it on many different levels, just like you pointed out. It’s hard to break the habit, but I’m pretty sure I could be worse. There are worse habits, and they can be useful. Good Analysis of the … because I use it often (even in french), to say I’m thinking, to say, I let you imagines what’s next…, to do a pause, like if we were talking. I thought I read that at the end of a sentence you have to add a fourth dot which is the fullstop. You may decide to … which is correct. Or you may decide to …. So, is the often – seen “,,,” a typo of “…”? I used the ellipsis today to indicate my voice dropping to a whisper and I changed the colour of the text as well to grey to indicate a quieter tone, just playing about really. Then I used a lot of periods. Like this. It was a short post. As a copywriter, we’re only allowed to use the ellipsis ironically, or to convey a more vernacular voice. Even this feels waffly to me. Examining how we use it is fascinating, as it is literally an omission of information. very nice. I rarely use them, and now I know why. It seems like a lazy or depressing way to end a sentence. awesome post. 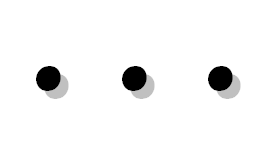 Great way to verbalize the overuse of the “dot, dot, dot.” I have become hyperaware lately of how often I use it in emails and have wondered to myself why I do it. Similar to your wife’s explanation, I had come up with ‘pregnant pause,’ but the uncertainty it’s the nail a little more squarely on the head. In my writing, I use the dot dot dots, but most of the time its for comedic effect. I enjoy making folks giggle. Also thats a great clip you found. Def Poetry was one of my favorite shows on HBO. Absolutely brilliant. You are very ‘self aware’ and insightful. I certainly use them as a display of my uncertainty, trying to remain aloof and/or when my thoughts and sentences are not fully formed but flowing into one another. Very deep post about something that could seem so menial! On another note, in ‘C’ language ‘…’ has the meaning of ‘whatever else you want to throw at me’. So you can define a function that accepts ‘whatever else you want to throw’ at it by using ‘…’ as a parameter. This is used in places where you cant explain what kind of values you expect. I usually use the dots to illustrate the pronunciation with a long tone at the end of the sentence. We have now made it a habit of leaving the “next” to readers imagination instead of depicting our thoughts in exact words.. Cool ! I really enjoyed this writeup! hmmm… Let me ponder this one. Not too big a fan of wimpering, but I like the thoughtful pause application….I think so, anyways. if we use words to communicate a message — why do we use these, when nobody knows what it means? to me, they are mean. …I use them all the time in email, but seldom in letters or formal memos…which we seldom use anymore anyway. I don’t use them so much due to express uncertainty or hesitancy, but mostly as an informal way to link semi-connected thoughts……….or a pause……..or because I am not sure, or lazy, or don’t care, what type of punctuation……should I use a period, a coma, a semi-colon or what…..or should I start a new sentence with a capital or what. I will even start an email with the dots so it doesn’t sound so stiff or formal. I don’t like periods and new sentences with capitals….I can do 3-5 dots a lot quicker and keep the flow going. (…do you use dots after a question…? ?….I do it all the time to emphasize the question and make it easier to see the question mark…) But I will start a new sentence for a complete new train of thoughts, but I am also inconsistent. I like the dots, but the odd thing is that no one else in my circle of say 100 clients, associates, and consultants uses the dots…..and I have been doing this for at least ten years or so…and no one else has picked it up.